For Blue and Forrest, making it back to Karran was the easy part. They were prepared to learn a new language, new customs and tackle a new kind of relationship. 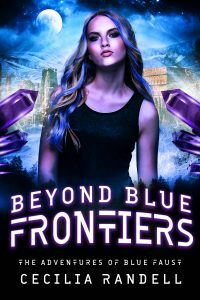 When Blue's reunion with Mo'ata is marred by unfinished business, she has a decision to make: proceed with her original plan and attend classes at the Ministry's Academy, or set herself up as bait for a madman. Phillip is still out there, still using that crystal, still killing. Throw in cub-babies with razor claws, overprotective clansmen and mercenaries, and long-lost mob families, she's once again in over her head. But that's all part of the adventure, right...?